A musical shooter powered by Unreal Engine 3? Yes please. Square Enix is no stranger to mobile, having brought multiple Final Fantasy games to both iPhone and iPad, along with the original Chaos Rings adventures. Now the company's hard at work on a more unique experiment called Demons' Score, a rhythm-based experience coming this summer for iOS and Android. The fact that the company built this title using Epic's Unreal Engine 3 makes it all the more intriguing. Demons' Score, oddly enough, is an on-rails shooter starring an attractive and scantily clad woman named Serenity, otherwise known as an average college girl. When her father mysteriously disappears, she sets off to find him at the lab facility where he works. Once there, she winds up touching a strange program known as the Demons' Score, whereupon which all Hell literally breaks loose. Now, with demons possessing her body, Serenity's journey begins. Yes, the plot is a bit weird, but we didn't expect anything less from Square Enix. Obviously, the actual gameplay is the most important part, and it appears the company may be onto something, as it seeks to fuse intense monster battles with music. You view the action through Serenity's eyes, and time your shots using on-screen prompts that move clockwise. Once the dial reaches the 12-o-clock position, you tap that specific icon to deal damage to whatever enemy it lays across, all the while using these taps to enhance the music. There's more to it, but based on our limited time with the game, that's the gist of how things go down. While on the subject of audio, Square Enix has enlisted some of Japan's most celebrated composers to create Demons' Score's soundtrack. Although the publisher has yet to reveal the full list, we do know that Kohei Tanaka (Sakura Wars series) and Yoko Shimomura (Kingdom Hearts series) are on board. 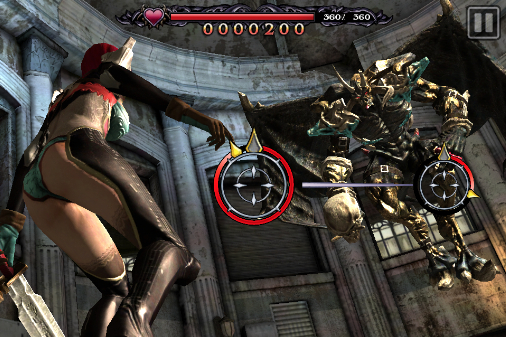 What's more, Square Enix has worked closely with NVIDIA to make Demons' Score compatible on Tegra 3-powered Android devices, with the chance of this version looking better than the one iOS users will see, thanks to advanced bloom effects, dynamic shadows, depth of field and higher resolution graphics. Regardless of which platform you choose, though, we think the game will shine, with detailed characters, intimidating demons and dingy corridors. To that end, we care more about the overall speed of this title and whether or not it suffers from performance issues with so much happening at once. On that note, we can't wait to plug in some headphones and immerse ourselves in what could be one of the best rhythm-based games to date. With this in mind, expect to see Demons' Score on the App Store and Android Marketplace within the next couple of months.